How did Dogmatic come to be? The short answer is ‘Necessity is the Mother of Invention’! It is difficult to know where to start as it is something that has evolved completely by chance and out of necessity rather than some grand scheme. Susan Lewsley, my Mum and the designer of the Dogmatic, has had back/leg and neck pain for 28 years due to disc/nerve problems and arthritis resulting in seven major back operations and one major neck operation plus arthritis in her hands. She is currently recovering from her latest surgery. This meant she could no longer walk or even hold our dogs let alone be involved in showing them. We had Dobermanns for 26 years (including Tommy, Top Dobermann in the UK 2000) and enjoyed showing same. We were using the known makes of Headcollars but found, not only did they not stop them pulling, they were all rubbing and riding up into our dogs’ eyes and they had even managed to get them off. We found neither the Headcollars or harnesses were taking the strength or weight of the dogs and, in fact, the dogs were putting their weight against the harnesses thus making them even harder to hold on to with some makes rubbing them raw! Mum’s problems were being aggravated by trying to cope with our three Dobermanns and walking, showing or even holding them was no longer viable. Rather than give up, she decided to experiment with a Headcollar that would work by turning the dog’s head in a kindly manner which would ensure the body would have to follow, yet was comfortable to wear and would stop your dog pulling and lunging. We had a local saddler help with prototypes/samples etc., Many ideas/styles were tried and tested until we were happy with the finished product. The Headcollar evolved into the present design and the finished product not only is comfy but does not ride up or go near the dog’s eyes. It works on all breeds/sizes of dog and ensures your dog will immediately follow where you want to lead. An extra bonus is that, in an emergency, the Dogmatic can be used to close the dog’s mouth and turn it’s head to enable the owner to keep their dog safe but immediately releases again allowing the dog to pant, drink, carry a toy etc., It is very comfortable for the dog to wear and offers complete control for the owner. 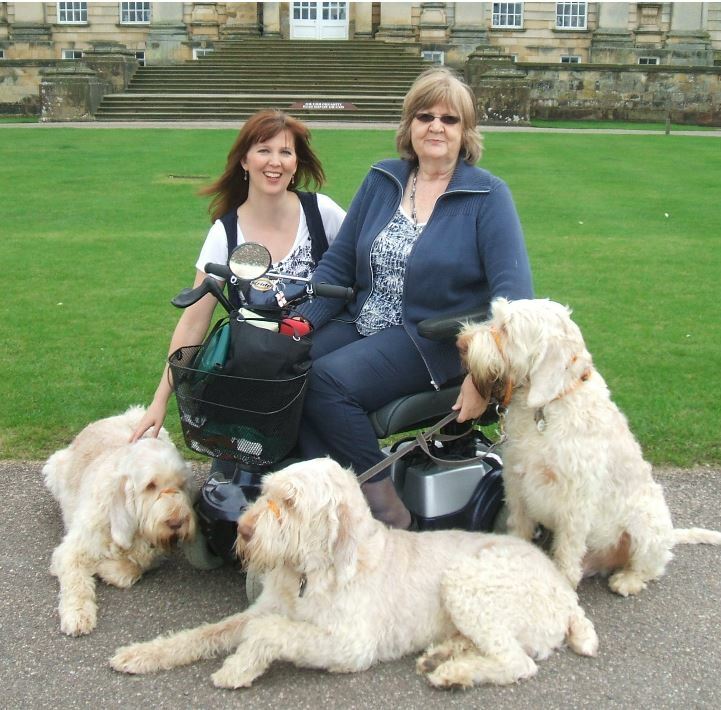 We have even been able to help other disabled owners with their dogs and also dogs in rescue who were previously untrainable and, therefore, unable to be rehomed. We had three black leather Headcollars with brass fittings made for our dogs and this meant Mum and I could now walk the dogs together and she could hold them when I was in the ring etc., This was a major lifestyle change. The name Dogmatic and the strapline (Automatically Leading the Way) literally came to Mum in the middle of the night and she jotted them down on a pad by the side of the bed together with a few less desirable ones before going back to sleep! We started using the Headcollars on our dogs and were astounded at peoples’ response. We literally kept getting stopped wherever we went, be it in the field, training, walks, Shows, at the Vet etc., etc., People would ask if we could make them one for their dog and so it began! We realised we would have to learn about sizings and how to fit all the different breeds. Neither of us are natural sales people or over-confident by nature so it was interesting to have to approach people to ask if we could measure their dogs and trial our sizing samples on as many breeds and cross-breeds as possible. Fortunately, most dog owners are a very friendly lot and everybody was very helpful and eager for their dogs to be included in the research! We were having them made individually at the Saddlery to begin with and then as word of mouth spread we found a small Independent Leather Manufacturer in Birmingham. They were so helpful and allowed us to order in small quantities. They also helped with leads Mum designed, in particular specialised non-slip leads which give you much more grip on the lead – again designed through our own need which is a whole different story! I was still working at Reading University as Post Graduate Admissions Co-Ordinator – I have worked as Customer Services Manager and in Admin Officer roles, whilst Mum is a fully qualified Secretary/PA - and I was fulfilling orders part-time. We were on a huge learning curve and had to get advice/help very quickly. Mum was in and out of hospital and I realised I would have to go part-time at work if we were to take a gamble and ‘go for it’ on a small budget and a prayer! Our name started to grow through small adverts and ‘word of mouth’. We needed to expand and found a larger Equestrian Leather Manufacturer, organised packaging, labelling, printing etc., and gradually we grew to such a degree I had to go full time in 2001. We have slowly built up Dogmatic and the Headcollar, collars and leads are now in Shops, Vets, on Trade Stands, being used by Police, Prison Officers, Rescues, Behaviourists, Trainers, Clubs etc., as well as individual dog owners. We try to help small Businesses, Clubs, Rescues etc., by offering low minimum orders at trade prices so any profits can go back into them. 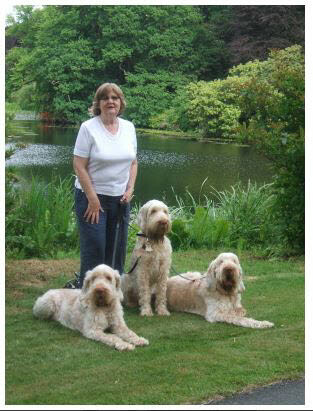 It is also endorsed by famous dog Behaviourist Dr David Sands and recommended as his Headcollar of choice in his books. Over the years we lost our Dobermanns but had fallen in love with the Italian Spinone and had Kofi who became our new mascot and model for the Dogmatic. We have gone on learning and expanding and we now also have a range of Headcollars, Collars and leads in Padded Cushioned Webbing which are vibrant in different colours. We have a specialised Training range in top quality lined leather available in black, brown and pastel colours. We have designed our own packaging and branding and it is amazing to see the boys’ photos on the packaging on the stands at the Shows and Crufts etc.,! We have very recently lost our wonderful boy, Kofi, at the age of 12 years but still have his son Archie and Archie’s son Norman and they are our models and attend pet Trade Fairs with us and we all have a marvellous time but it is getting more and more difficult for my Mum to cope with same. 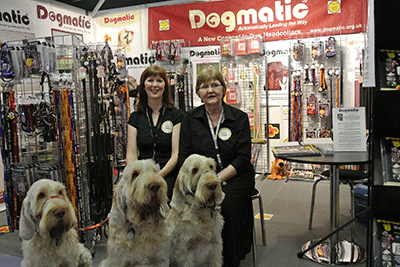 The Fairs are very successful and the dogs love all the attention they receive! In fact we could have sold them ten times over!! We are supplying a rapidly growing number of Shops, Vets, Training Schools, Behaviourists, Groomers etc., and the more we can get the Dogmatic out there for the general public to see and try on their dogs, the easier their dog walking will be! As you can see we have a large amount of customer feedback –where the Dogmatic has literally changed their lives and meant they can walk their dogs without having their arms pulled out of their sockets! We have a Facebook page and Twitter Account and a large number of photos and videos from satisfied dog owners. We still have to pinch ourselves to believe how far we have come since Mum designed a Headcollar which has been voted Top Headcollar after a six month trial of six makes of Headcollar by Your Dog Magazine, Highly Commended accolade within ‘Product I can’t Live Without’ category of Your Dog’s Pet Product Awards and voted Tester’s Choice of Headcollar 2011. We have won ‘Product I can’t Live Without’ in the 2014/15 Your Dog Magazine’s Pet Product Awards. To see different breeds walking around the shows and street wearing our Products and hearing people discussing how good they are has been amazing. We have even seen the Dogmatic on several TV programmes! 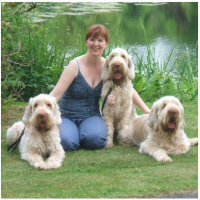 I run the day to day business with the help of a small team of dog lovers and it is great to speak to so many dog people from all over the World and hear how much the Headcollar has helped them. Whilst I am keeping up to date, Mum can rest when necessary but continue designing and she has several ideas she is working on. Learning about book-keeping, sales, tax etc., is not such fun and we will never be natural sales people, but that’s no bad thing! It has been an amazing journey which has been a learning curve, but we could never have imagined how an idea could have changed our lifestyle in such a way! But the fact we are able to work and have Archie and Norman with us more than makes up for any negative aspects. The boys love being with us and it is a joy to watch them all playing or sitting at our feet in the office.